As a student at Hastings College you’re an important part of our history and traditions. Some are fun, some are silly and some are (thankfully!) retired. What will it mean for you to be a Bronco? What traditions will you create? This is a one-stop-read of all things Hastings. Dating back to the 1930s, the H Book is crammed with history, traditions and more — it shows what being a Bronco is all about. Back in the day, first year students could be spotted wearing green beanie caps until the first snow flew. That’s one tradition that’s gone away, but the ones below continue. Held the weekend before classes begin in the fall, this fun tradition helps familiarize all new students with campus life at Hastings College. In an informal atmosphere, students meet members of the administration and faculty, as well as returning students who represent campus organizations. This is the biggest and most colorful event of the fall term! A spirit competition between student organizations kicks off the weekend and the festivities continue with a bonfire and pep rally. Plus there’s the crowning of Homecoming royalty, a parade, home athletic events and the popular Homecoming Dance. After returning from Thanksgiving break, you’ll catch the Christmas spirit back on campus! 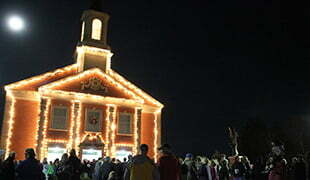 The campus celebration begins with the Lighting of Campus event when nearly 1,000 luminaries are lit and a live nativity is staged. Musical events, readings, cookies and wassail and, of course, a visit from Santa and his elves, will put you in the spirit of the season. Perhaps you’ll even catch a carol or two from the French Memorial Chapel bells. 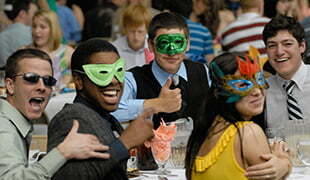 At this formal, sit-down dinner you’ll be served by faculty and administrators. You can’t beat asking for more coffee from the professor who’ll give you your first final a few days later! Still, faculty don’t hang around too long because we hear it turns into a bit of a faculty roast. Pre-dinner festivities include Christmas music and the traditional walk through the candle-lit dining hall by a student carrying something interesting on a platter. Held every April, this is a campus-wide celebration of the liberal arts! Classes are canceled for the day and you’ll have an opportunity to learn from your peers as they present highlights from the research they completed or insight they gained while studying abroad or taking a mission trip. The sciences, communications, business, English, religion, fine arts and more are on the docket — and someday that could be you in front of students, faculty and staff who join in. This long-running, student-planned event dates back to May 1, 1910. Over the years, it’s became the most popular spring event on campus. It traditionally includes outdoor games, a special dinner, dance and the presentation of the May Fete Court. It’s all the pomp and circumstance you’d expect!